Thousands of students continue to attend the University of Maiduguri in northeastern Nigeria despite at least a dozen attacks by the Boko Haram insurgency since the start of 2017. Muktar Muhammed is on the mic sending out a cheery "Good Morning" message. “It’s Friday morning here at the university. I hope everyone had a pleasant week,” he crooned over the airwaves. 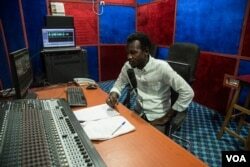 Muhammed is a disc jockey at the University of Maiduguri’s radio station KANEM-FM, 97.7. Students were still anxious from an attack earlier in the month in which Boko Haram terrorists invaded the city but were repelled by soldiers. Muhammed said part of his job, along with playing hot tunes, was to keep students calm. “We make it a point. We make it a priority to do that, to keep them positive. Of course, to try and stay relaxed, focused on their studies,” he told VOA. That’s because the University of Maiduguri sits in the very city where Boko Haram was formed and has continued to launch deadly attacks since 2009. Throughout Boko Haram’s nine-year war against the Nigerian government, the university was never attacked -- until January 2017. Defying the threats, the campus is abuzz with students strolling and laughing with each other before summer vacation. More than 20,000 are enrolled, and the student population is growing. “I found myself in a very terrible situation in such a way that I had even thought of going back home,” Hassan, from northern Nigeria, told VOA. But he stayed, like many of his classmates. Since then, the university has been attacked at least 12 times by suicide bombers, university officials told VOA. In July, suspected Boko Haram members kidnapped 10 members of the university’s geology and surveying department. They were later rescued by the Nigerian military. VOA reached out to the geology lecturers for comment, but they declined. The University of Maiduguri is the most prestigious and largest public education institution in northeastern Nigeria. The students are defying Boko Haram’s message that condemns Western education as sinful. 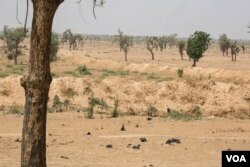 Local reports said some of the university’s students joined Boko Haram in its early days. School administrators could not confirm that allegation. Throughout Boko Haram's insurgency, the university has not closed for a single day. “To show how resilient we are, to show how much sacrifice we are making and that is the true reflection of the Maiduguri spirit -- we are here because we have a responsibility to keep the system going. Someone has to be around no matter how bad the situation is,” said Danjuma Gambo, a mass communication professor and the university’s spokesperson. Gambo said the university was too important to close, even for a day. That’s why city and state officials said they would do anything in their power to keep the university open. The commissioner for the Borno State Ministry for Education, Musa Inuwa Kubo, told VOA the university is a source of pride. “Most of us are products of that institution, and the resilience of the University of Maiduguri during the insurgency, ought to be commended by everybody,” he said. The university is enormous. Approximately 27 kilometers (17 miles) of trenches line the campus perimeter, mainly the eastern side that faces Nigeria's border with Cameroon where many Boko Haram insurgents operate. The trench, commissioned in 2017 by the Borno State government, is a measure to slow incoming Boko Haram terrorists who usually invade the city in convoys of motorcycles. Every day, sniffer dogs carry out inspections at two of the university’s entrances, searching for bomb chemicals and weapons. No other public Nigerian university in the region has this level of security. It’s why Esther Clement continues to attend the university. 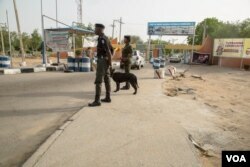 “Even though there is an insurgency, we are secured. Even before you come to the gate, the Gate 1, there are securities here and there. At the gate of the hostel, there is security," Clement said. "Even when there is bomb blast, they call us to calm us down. We don’t go out." She has one more year of studies before she will receive a degree in mass communication. “I want to become a reporter, so I can inform people about Boko Haram,” she added.